Measure the ingredients for all of your favorite recipes with this Cambro 400MCCW135 Camwear 4 quart measuring cup. "We use these constantly and they're holding up great. We use them for both hot and cold liquids with no problems. 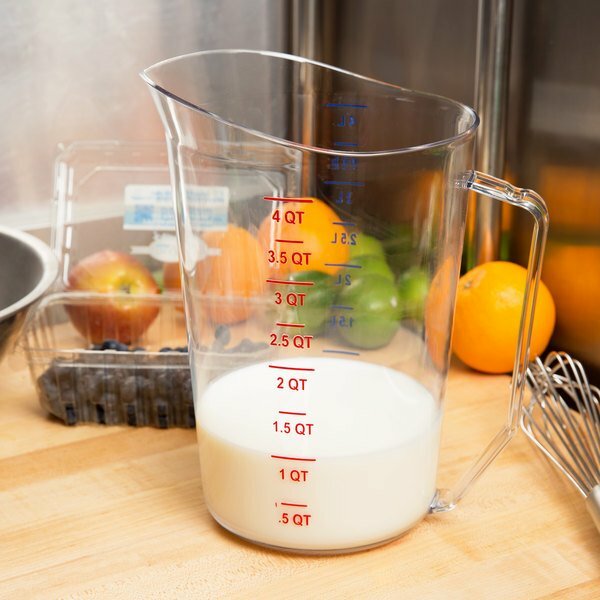 These are sturdy and well-made and will be our go-to anytime we need more measuring cups." Made of strong, virtually-unbreakable polycarbonate material, you can be sure this measuring cup will not dent under everyday use. It also features a sturdy base to help prevent spillage. It features a securely fastened, molded-in handle that makes for a smoother pouring process. Plus, this cup also provides a spout for less spillage and little cleanup! 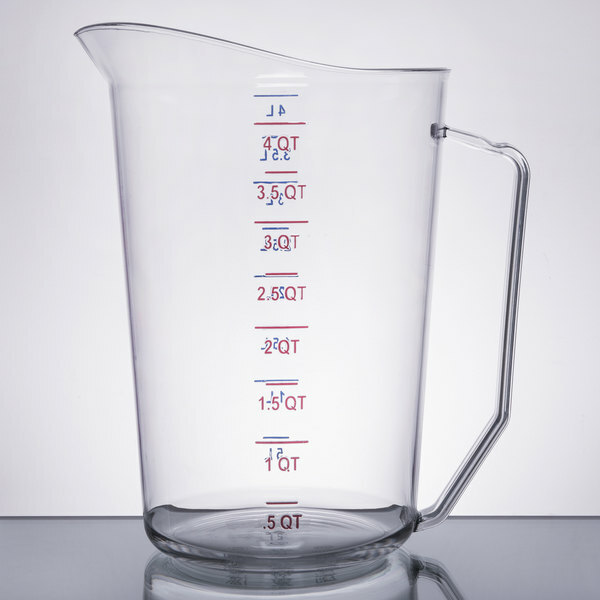 The dual measurement systems in blue and red make it easy to measure and differentiate between American standard units and metric units, making this measuring cup perfect for international restaurants. Having a well marked, sturdy equipment is very important in a busy kitchen. 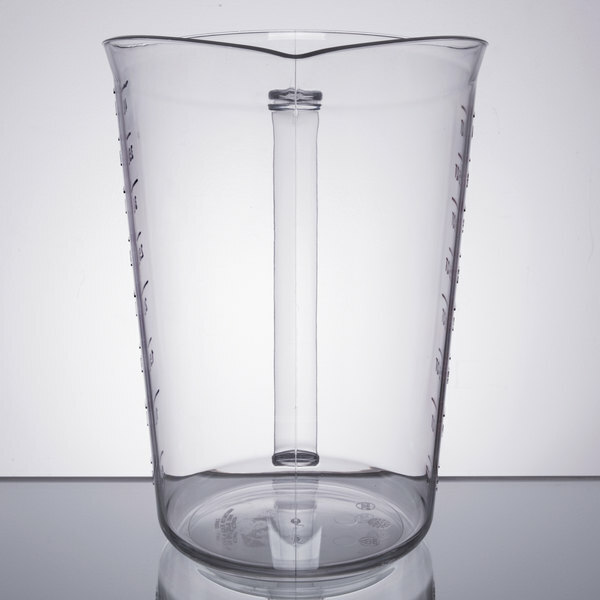 This clear measuring pitcher is everything you could want it to be. The cambro brand is the gold standard for polycarbonate kitchen tools. This pitcher doesn't disappoint as it is made of extremely durable material and the graduation marks are raised and clearly legible. 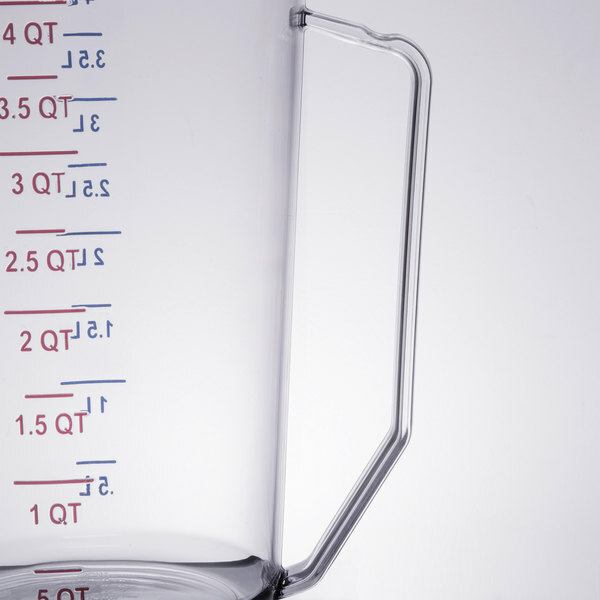 Large & In charge, this measuring cup can handle most any needs in a commercial kitchen. perfect for large batch and precise measuring, this one does it all. a+ item as described. being in a commercial kitchen, plastic materials (rather than glass) is a plus. 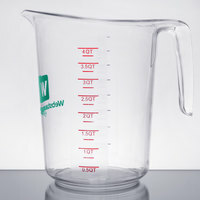 We are using these to precisely measure ingredients for our small-bath salad dressings. Purchased these items to replace older worn out items. Overall they hold up well. The only issue is that the numbers lose their red color rather quickly but they are raised so you can still see what they are. Just aren't as easy to read. Unless its glass we've noticed this is the case. But for the money difference its a trade off we are willing to make. High quality very large measuring cup. This gets used and abused but has not broken yet, You need this if you do any large batches of prep or recipes. A kitchen essential, especially when doing larger quantity recipes. Easy to use and the well marked measurements have stood the test of time and not worn of as some have a tendency to do. I love it it! It's massive size is great for many prep uses. It's great for drinks & batter mixing. I place a strainer on top & strain my loose leaf ice tea into it. Pour & enjoy. It works perfect. Durable, easy clean up & very versatile. 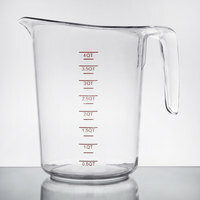 This is a great large 4 qt. . measuring cup. It has easy to read measurements on both sides of the container. This large size makes measure 1 gallon easy and quick! 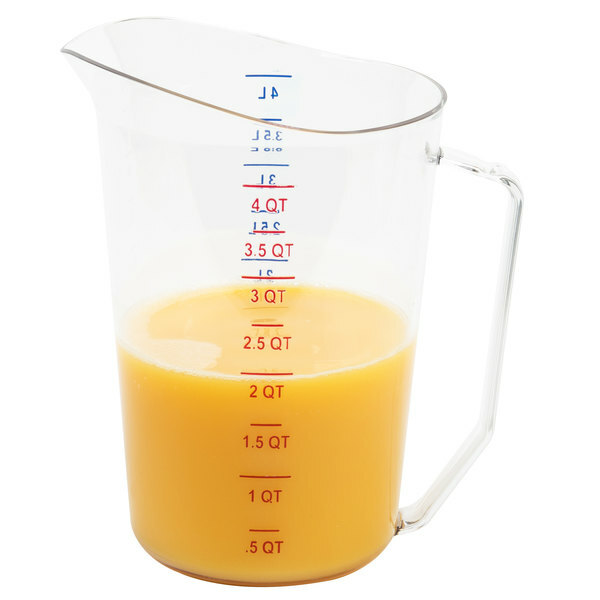 Nice thick walls make this measuring cup really durable. 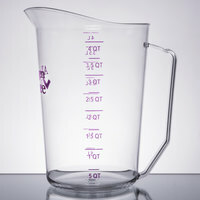 With a large volume it is perfect for big batches of items where a smaller measuring cup is just not practical. I love this measuring cup. It's great to use when I am making large batch soups and stews, especially when the recipe calls for immersive blending some of the soup for thickening. You just scoop it back into the measuring cup and it houses the stick blender beautifully. Easy peasy, pour it back into the pot. great item! it does not absorb the colors of some the items that are measured in it. the lettering last a lot longer on the outside than other items that I have used I will defiantly be re-ordering this item ! Top of the line Cambro durability. 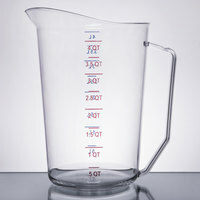 This measuring cup can be used with hot or cold, liquid or solid product. Easy to read measuring marks and dishwasher safe. Well worth the investment. Great quality measuring cup at a great price. We have most all of our equipment and small wears purchases to the folks here at Webstraunt. Love this it is quality made!!! I will be ordering another one and different sizes! Extremely sturdy and cleans up very nicely. it is also very easy too handle!! I received my Cambro 400MCCW135 Camwear 4 Qt. Clear Measuring Cup was very pleased with it. Measurements are easy to read. This is a good product and price.